When he sees the horrifically charred corpse of Morgan Stroud, Detective Inspector Douglas Niven isn't sure that there is a criminal case to investigate: at first glance the grisly death seems to be the result of a rare natural phenomenon: spontaneous human combustion. According to the victim's sister, it is simply a manifestation of God's revenge. After all, Stroud has been a very unpopular character: his pupils at St. Jude's Academy had often wished the bullying master dead; his estranged wife still bears the scars of his cruel treatment; and fellow teachers George Emslie and Angus Townes both have axes to grind. 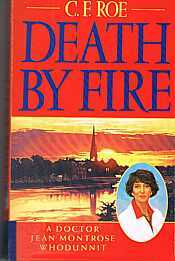 When a second body is found in not dissimilar circumstances, Niven realises he doesn't have the specialised knowledge to break the web of silence and superstition, and turns again to Dr. Jean Montrose, whose medical expertise and good-natured commonsense finally unlock the gruesome secret of the fiery deaths. The alternative name of this novel is "A Fiery Hint of Murder "